Lock in a great price for Moab Land Hotel – rated 8.1 by recent guests! Listen, what can you expect for only $39 a night. The accommodations were sparse and old but as clean as they could be given those factors. We initially had some problems with water backing up in the shower, but the manager fixed that quickly. I was taken aback at the number of stairs we had to climb. But then I'm not as young as I used to be and stairs have become troublesome for me. They don't advertise the availability of a television in your room, so don't expect one. The hotel was kind enough to let two of my family clean up for their flt that night even though it was just my wife and myself staying the night. Very classy. Location, very decent breakfast, very helpful owner. Nice staff, very good position, A/C, rooftop terrace, balcony, so I think that for 1 star hotel is very good, more than I was expecting. Ibrahim the manager, receptionist, maintenance person among other duties and titles he held, was very accomodating, friendly, courteous and got us to our room earlier than scheduled check-in time, and had breakfast ready for us very early at dawn so we could catch our even earlier flight out. He gave us informations we needed, all we had to do was ask. The facilities are clean, room is just as I expected, and the room rates are very affordable. 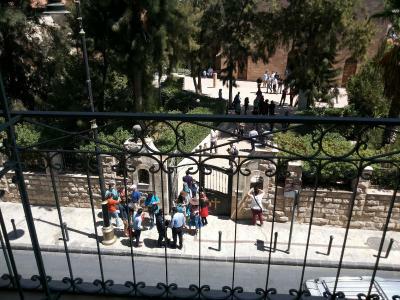 Good location in front of the most important place in Madaba to visit: the church with the Middle East mosaic map. Breakfast was based on the Jordan tradition. The receptionist was very hospitable. The location right at the heart of the town. It was nice that we had a balcony with view. Moab Land Hotel This rating is a reflection of how the property compares to the industry standard when it comes to price, facilities and services available. It's based on a self-evaluation by the property. Use this rating to help choose your stay! 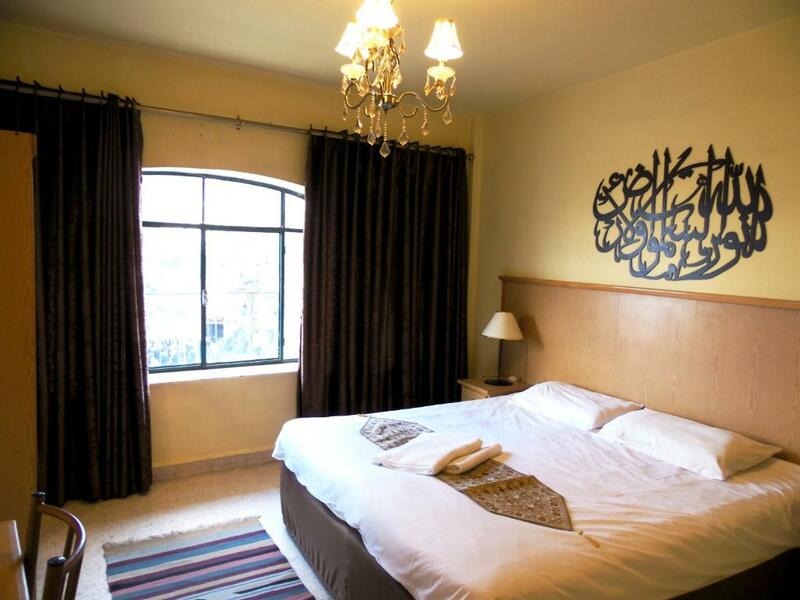 Located in the center of Madaba, Moab Land hotel offers simply furnished accommodations. Free WiFi access is available in all areas. Each air-conditioned room is ceramic-floored and comes with a desk and a wardrobe. The bathroom includes a shower. 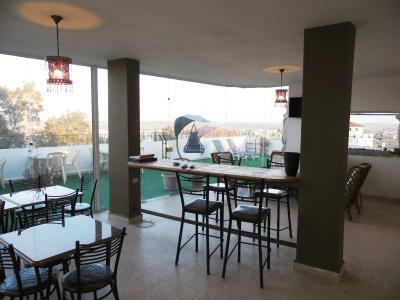 A simple continental breakfast and afternoon refreshments are provided daily for guests. A 24-hour front desk offers luggage storage facilities and the tour desk can provide information on Jordan. 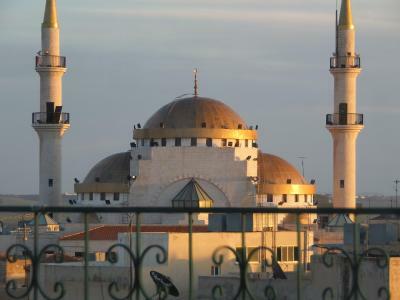 The hotel is 50 feet from the Greek Orthodox Basilica of Saint George, 5.3 mi from Mount Nebo and 1,950 feet from Madaba Bus Stop. Queen Alia International Airport is 11 mi away. When would you like to stay at Moab Land Hotel? 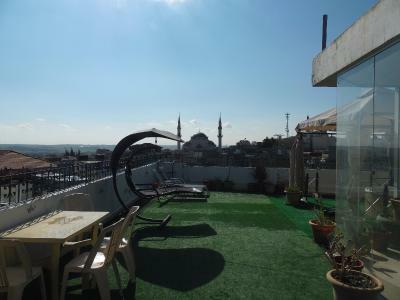 This air-conditioned double room features a balcony, a wardrobe, a desk and a fan. The bathroom is fitted with a shower and free toiletries. Private parking is available at a location nearby (reservation is needed) and costs JOD 3 per day. This air-conditioned room features a garden view, a wardrobe, a desk and a fan. The bathroom is fitted with a shower and free toiletries. House Rules Moab Land Hotel takes special requests – add in the next step! Moab Land Hotel accepts these cards and reserves the right to temporarily hold an amount prior to arrival. The property provides an airport pickup for an additional charge. Guests wishing to use this service need provide their flight details in advance. Please note that according to the national law of Jordan, Arab nationals are not allowed to stay in the mixed dorm rooms. We arrived at 4am and the late check in was super easy. Nice rooftop terrace. Nice and helpful staff. 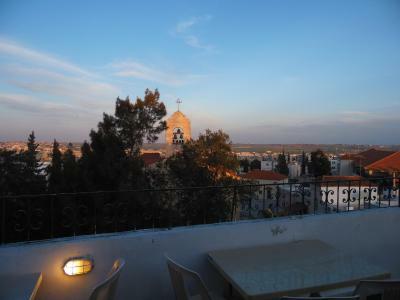 Perfect place to venture around Madaba as it is opposite of the Church! The swimming pool was still closed. The food in the restaurant is very basic; We didn't like it. Very expensive wine. Breakfast was OK.
Spacy room with a nice view on the surrounding area. Very friendly staff. Good parking spot in front of the room. We liked the location and the information given by the person in charged about how to reach certain places in town and outside town such us transport and prices. Very near Ayola and delamore restaurant both good and cheap restaurants. 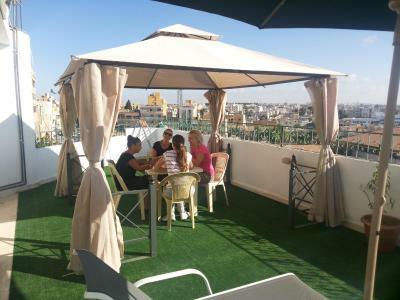 Beautiful terrace with excellent views of important sites in town. Typical Jordan breakfast. The room was not as expected, furniture quite old, no hangers into the wardrobe, uncomfortable mattresses. The bathroom seemed not really clean, encrustations into the shower and on the sink. PERFECT POSITION, really central. The owner has been really kind and helpful, giving us suggestions for places to see, restaurants. 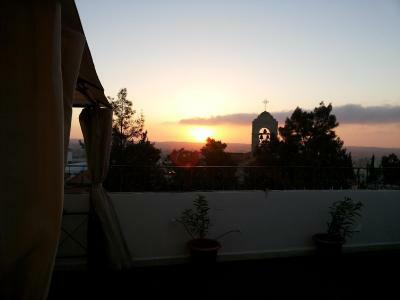 The sun terrace is beautiful, just on Madaba centre. Nice room terrace on Saint George Church. Good Breakfast tipically Jordan, not continental as written. Beds were not comfortable - we both had a stiff back the following morning. But maybe OK for other people, my friend and I both have slight back problems which could have made the situation worse. Great location, convenient for a short overnight before heading to Wadi Rum the following day. 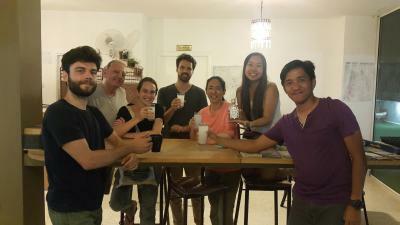 Very friendly and helpful stuff, very good location, clean and comfy room. 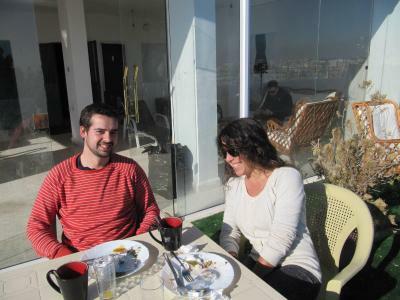 Excellent breakfast on the rooftop terrace. The internet wasn't working properly, not very good if you still need to plan your trip. Great location, good breakfast and the staff were really helpful and nice. Perfect choice for one night. The bathroom door is foldable and you cannot lock it, which is weird since it's a mixed dorm. Very cheap and good location. The location!!! Just in front of the Church, great view of the roof restaurant, where we breakfast. Big rooms with balcony. The receptionist was very polite and helpful. He also made for us a reservation for a beach at Dead sea with discount. Many thanks for the great stay at Moab Land Hotel. There is particular times for water (6am to 12pm and from 18 to 00). We booked economy room. It means that has no windows, making it a gloomy and a bit depressing. 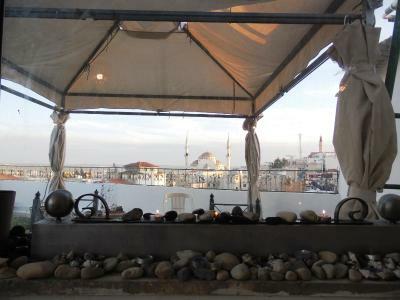 After review our reservation I saw a picture that indicates that. however I would put it more clear. 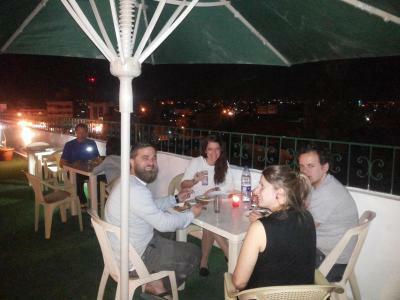 The location was very convenient, very close to the main attractions in Madaba, nice restaurants and shops. Room was very clean and bed was comfortable and nice. Staff was very helpful and friendly, giving us a map and indications of the tourist spots.